A fisherman who died after being swept away in a fast-flowing river has been named. Michael Anstice, from the Lintrathen area near Kirriemuir in Angus, was fishing in the River South Esk when he went missing. His fishing colleague had dropped him off on the river banks before going to park her car at the Inshewan Estate, near Forfar, on Thursday morning. When she returned a short time later, Mr Anstice had been swept away in the river. Tayside Police – including officers with swift water rescue training – were called to the scene, along with Tayside Fire and Rescue, the Tayside Mountain Rescue Team and the Scottish Ambulance Service, to search for the 81-year-old fisherman. A helicopter from RAF Lossiemouth was also scrambled to assist with the operation. Local residents and estate workers also helped in the efforts to trace the missing man. However, his body was discovered at about 2.30pm and recovered from the river. Tayside Police confirmed there are no suspicious circumstances surrounding his death and a report will be submitted to the procurator fiscal in due course. 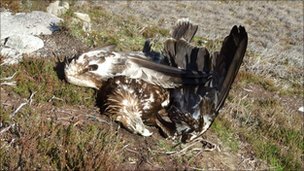 An estate worker had enough illegal poison to “wipe out the entire Scottish golden eagle and red kite populations several times over”, a court has heard. 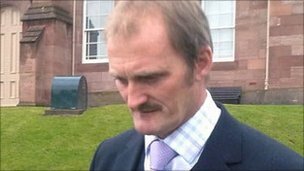 Dean Barr, 44, of Clashmore, Dornoch, admitted possessing 10kg of Carbofuran. The insecticide, banned in 2005, was found in a farm building, used by Barr, on the exclusive Highlands Skibo Castle estate in May 2010. Sheriff Margaret Neilson fined the former Ulster Defence Regiment soldier £3,300 at Inverness Sheriff Court. Despite the find, the Crown accepted Barr had no part in the deaths of two golden eagles and a sparrow hawk found on the estate in May 2010. The insecticide was discovered in a locked store by police investigating the deaths of the birds. Barr had the keys to the store. The Carbofuran found had been bought by a farmer to legally treat crops on a Scottish Borders estate where Barr had worked. The court heard that while father-of-two Barr had not purchased the powder, he took it with him – along with other items, from a shed when he took the job at Skibo in 2008. He added: “10kg is sufficient to wipe out the entire Scottish golden eagle and red kite populations several times over. Defence lawyer David McKie said Barr was aware of the risks Carbofuran posed, but he had not known how to safely dispose of the powder, which was kept in a plastic tub. Mr McKie said Barr’s case was one of “foolish omission” and that his client had been naive and had never used the substance. However, Sheriff Neilson said it was “extraordinary” that a man of Barr’s experience had not known how to legally dispose of Carbofuran and had been prepared to take it 200 miles north from the Borders to the Highlands. She told Barr that had he been found responsible for the birds’ deaths, he would have been facing a custodial sentence. She fined him £3,300 for possession of Carbofuran to “mark the court’s disapproval”. Later, also at Inverness Sheriff Court, a former apprentice gamekeeper was fined £1,500 after he admitted possessing a dead red kite. James Rolfe, 20, who was a gamekeeper at Moy Estate, said he found the bird of prey in a trap set for stoats and weasels but picked it up put the bird in a Land Rover rather than leave it and inform his bosses, the police, or RSPB. The bird was not poisoned. RSPB Scotland said it was pleased the sheriff had sent out “a clear message” that society would not tolerate “reckless and deplorable behaviour in the countryside”. Rolfe was found with the dead red kite by police who had arrived on Moy estate with search warrants, issued under the wildlife crimes act on 3 June 2010. Defence lawyer Iain Fleming said his client was 19 at the time and he had panicked after finding the kite dead in the trap.